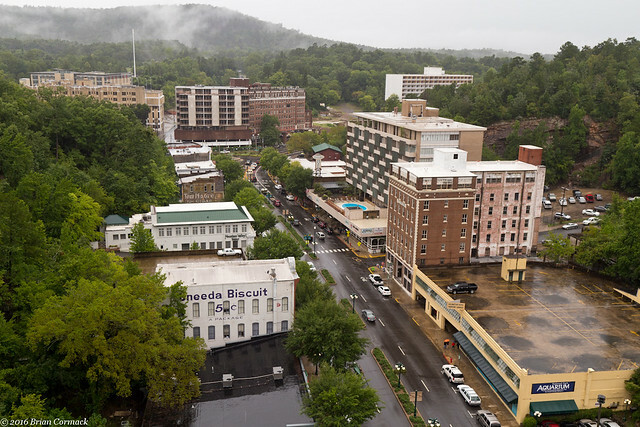 Hot Springs is probably the most unique city in the state. Here you’ll find the oldest park in the National Park system (it was set aside as a reservation in 1832). 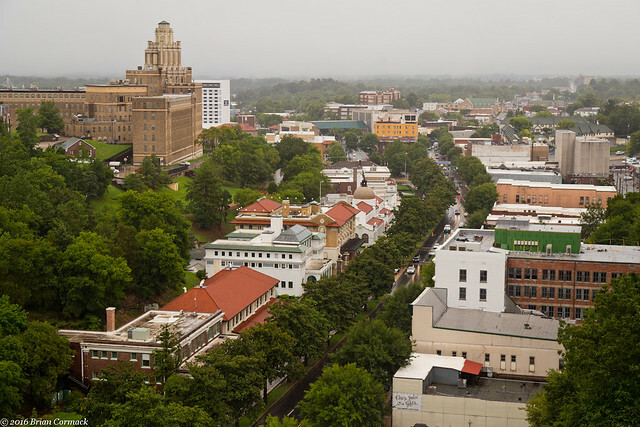 There is also an amazing mixture of architecture here, from the elegant Victorian bathhouses to the old commercial buildings that line Central Avenue. 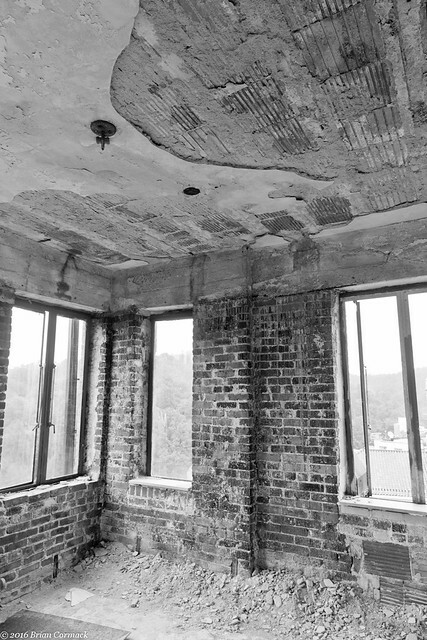 One of the most prominent buildings in Hot Springs is the old Medical Arts Building. 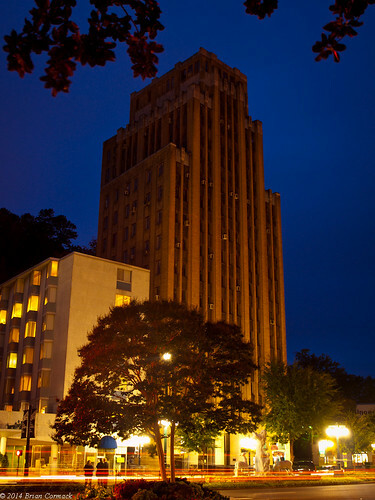 It was constructed in 1930 and is still the tallest building in Hot Springs. 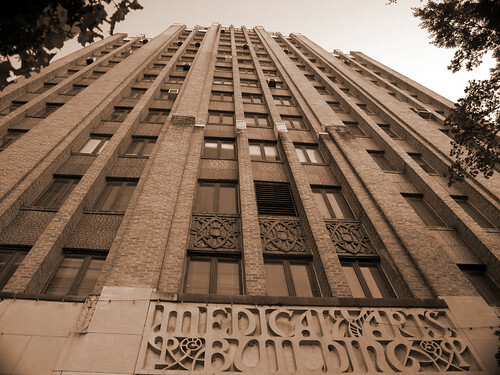 The Medical Arts Building was also the tallest building in the state for about thirty years, until the Tower Building was constructed in Little Rock in 1960. The Medical Arts Building was called the “Skyscraper of Health,” and it still towers over Central Avenue. The building was designed by the same architects who designed Little Rock Central High School. It is an imposing building, and has been called one of the finest Art Deco skyscrapers in the South. 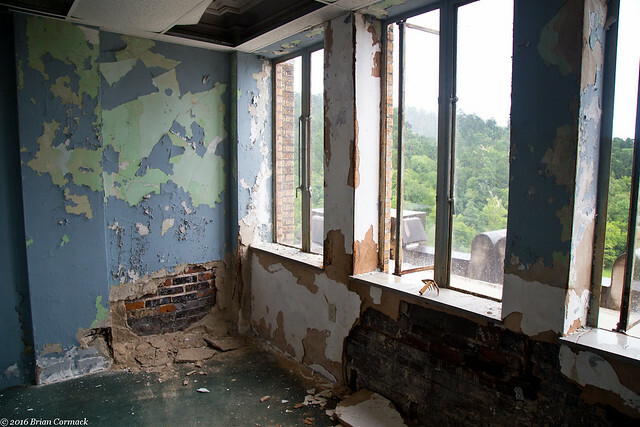 The Medical Arts Building was constructed in a time when tourists flocked to Hot Springs to take baths in the thermal springs. Hot Springs was the Las Vegas of its time, and along with the baths tourists also visited the casinos that used to operate illegally in the city. 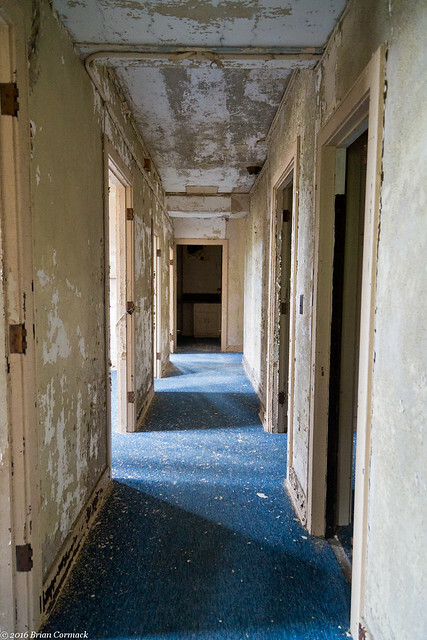 Visitors included Al Capone and Babe Ruth, along with several Major League baseball teams who held Spring Training here. 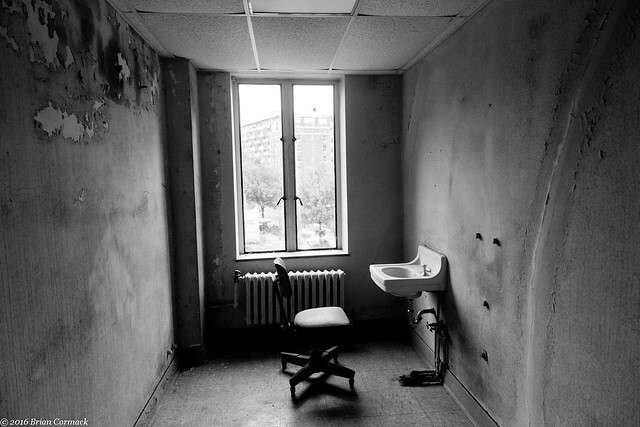 But the city began to decline in the 1960s, as people stopped believing in the medicinal powers of bathing and the illegal casinos were shut down. The Medical Arts Building reflected the changing times. 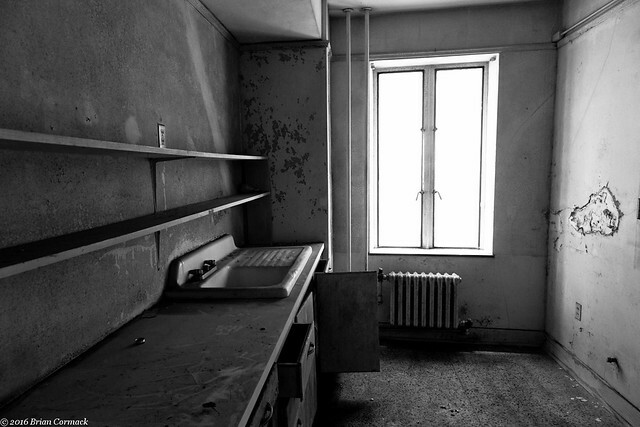 When it opened, the building was the home to numerous doctor’s offices. 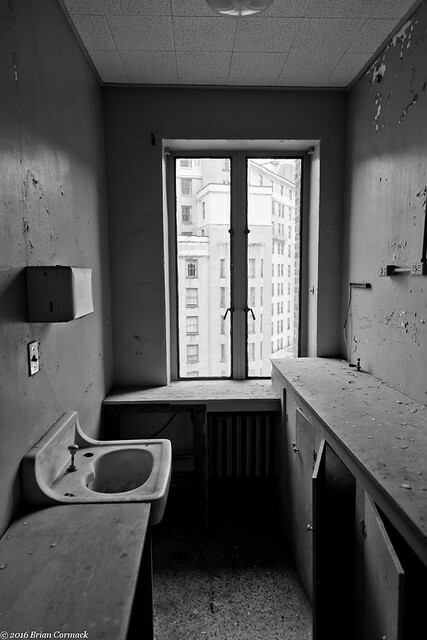 But with fewer people taking baths, the doctors offices began to move out. 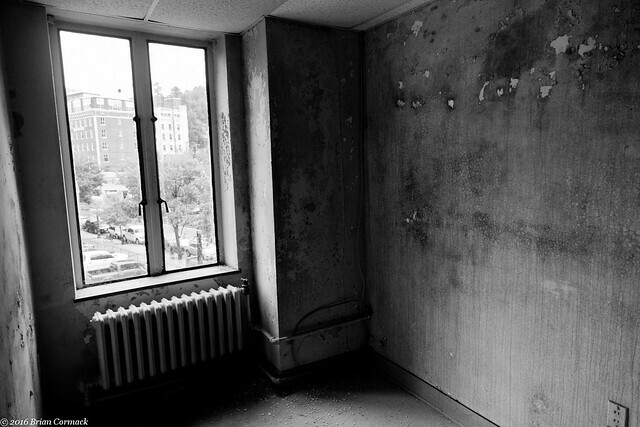 While the first floor of the building is still occupied, the other floors of the sixteen story building were fully abandoned in 1990. 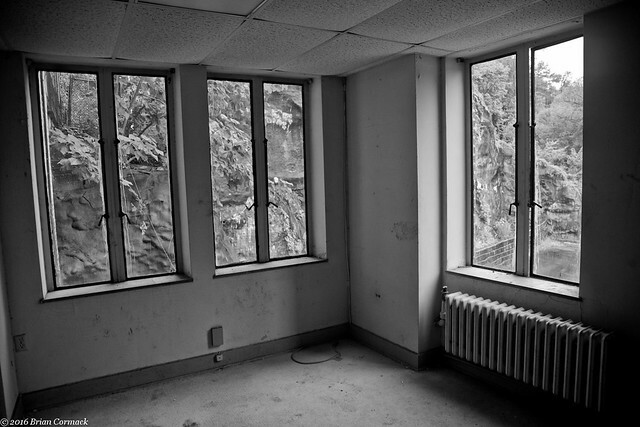 The building is currently listed for sale, and can be yours for only $1.75 million. 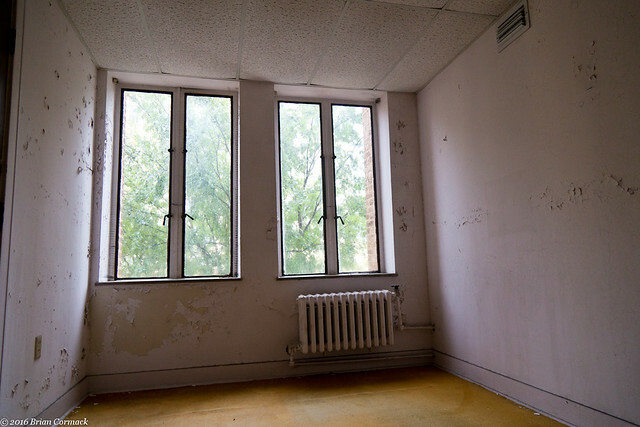 I was recently given the opportunity to tour the inside of the Medical Arts Building, which is still in remarkably good shape considering how long it has been abandoned. 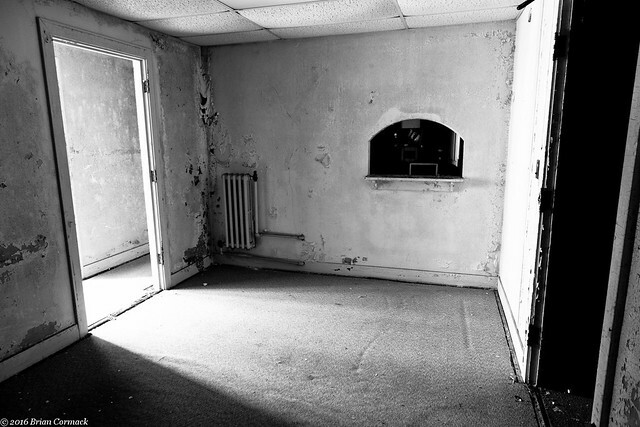 Several rooms still have furniture and carpet, and look like they could still be used today. 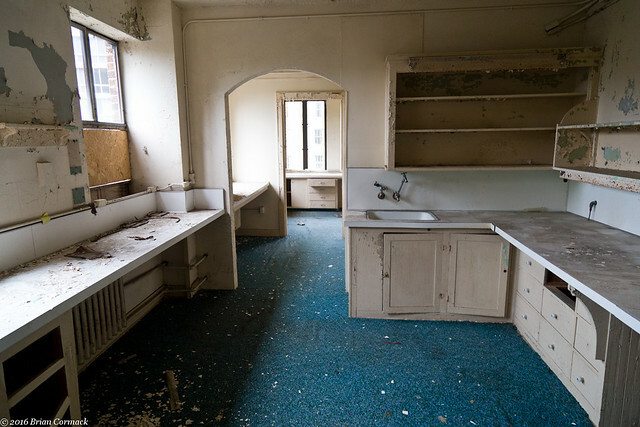 There are, however, a few places where there has been some serious water damage. 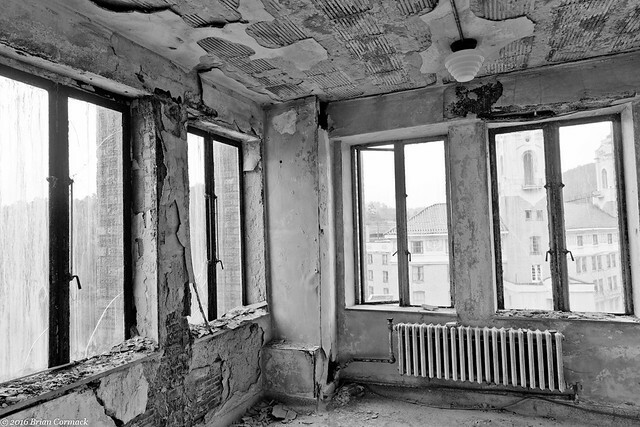 But even with the damage, the building could easily be saved and restored. 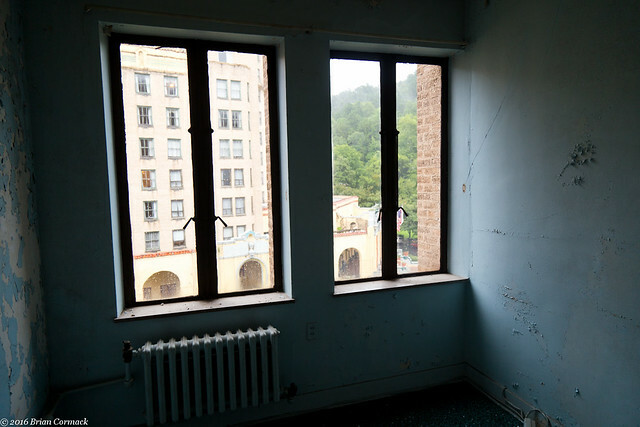 Many of the rooms in the building have views that are dominated by the Arlington Hotel, which is across Central Avenue. In the background you can also see the Hot Springs Mountain Tower. 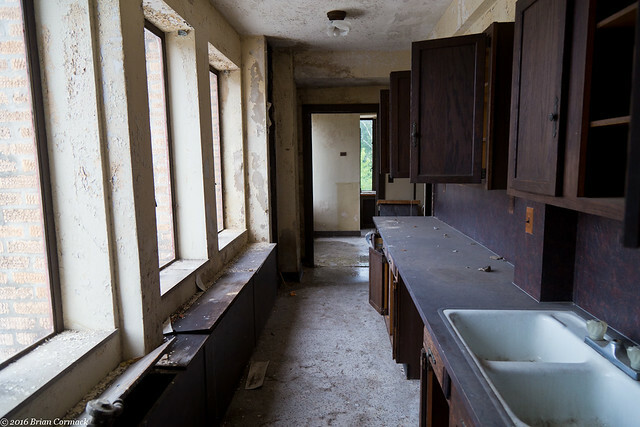 The best indicator that this building used to contain doctors offices is the large number of sinks that are still standing in many of the rooms. 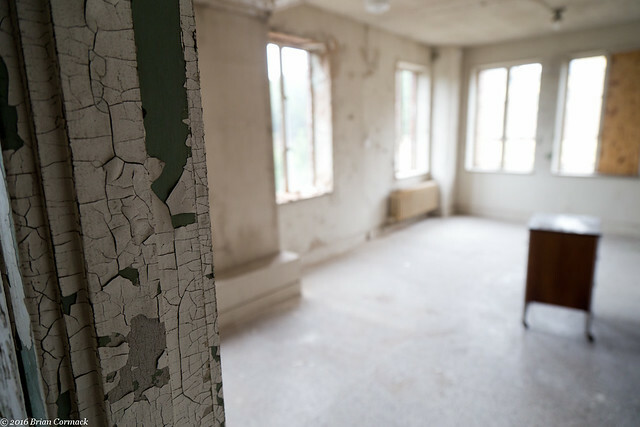 Several rooms had a lot of peeling paint, here it was curled up like paper. You can also tell that the carpet dates from the 1970s and 1980s, it is thick in and it came in all the colors of the rainbow. Here the carpet was a bright orange. 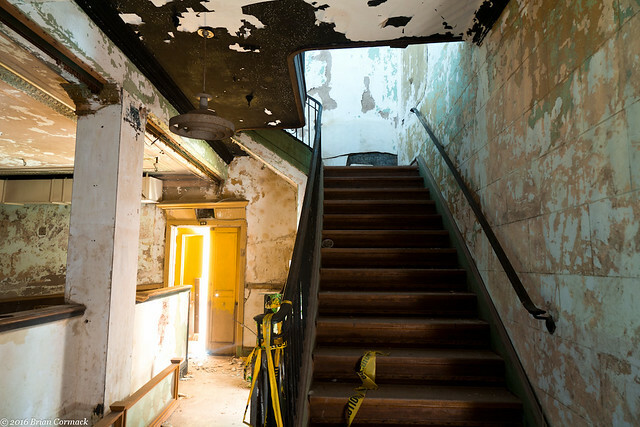 While the building was mostly in good condition, there were a few places where water had gotten in. 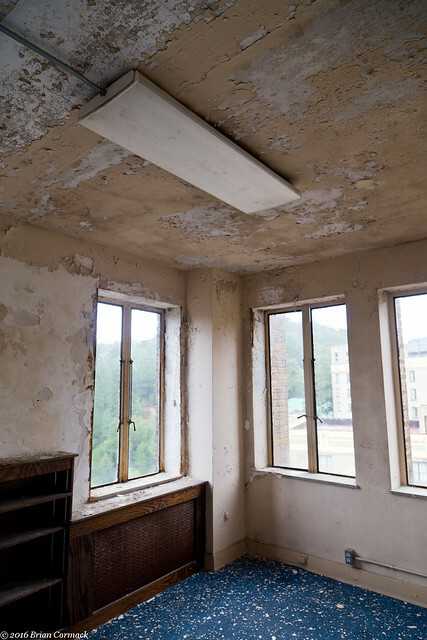 It had been raining for several days before this visit, so water had managed to find its way through windows that were either broken or left open. 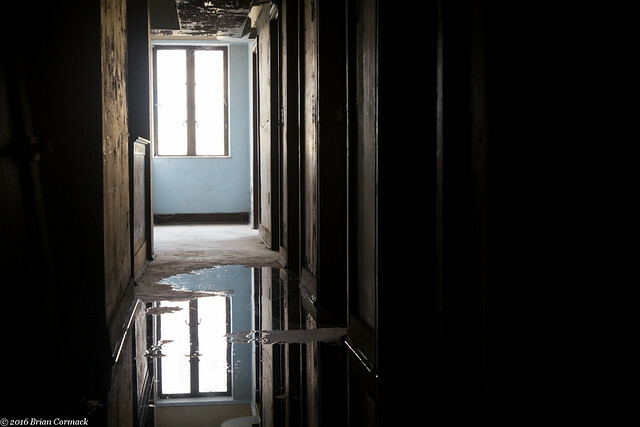 In a few places, water had seeped through and created puddles in rooms and hallways. And one room with a lot of water damage. 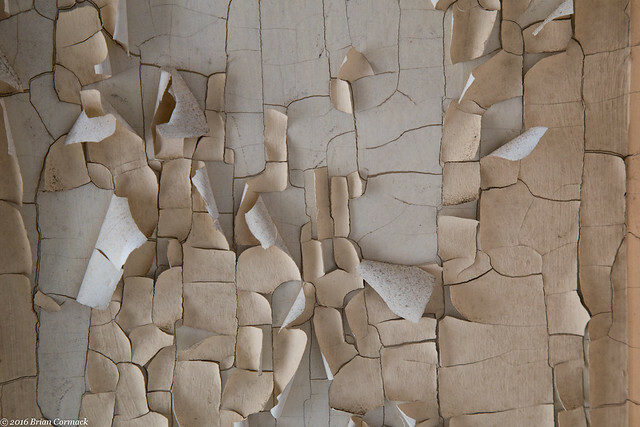 Soggy chunks of plaster were falling from the ceiling and walls. 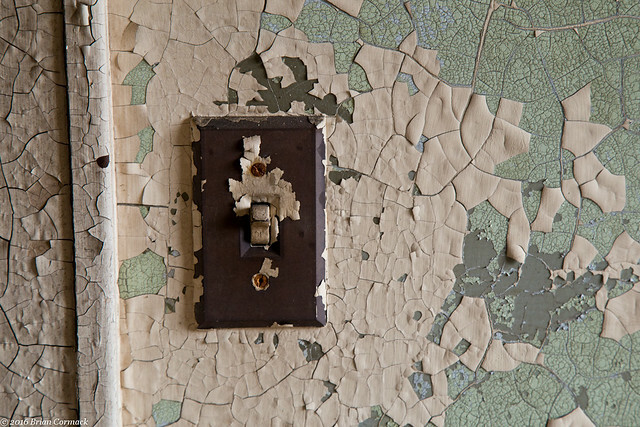 The paint was peeling around this old lightswitch. 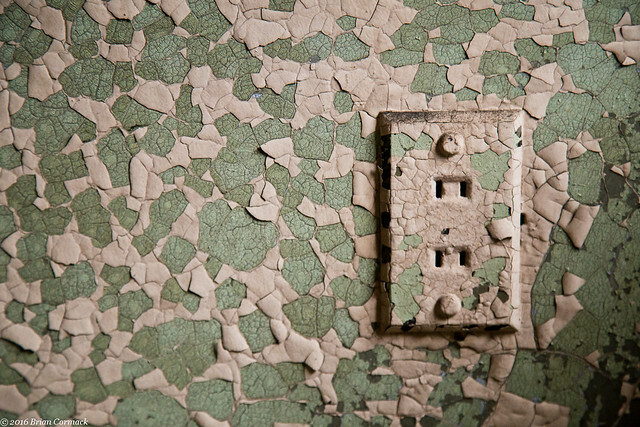 And also paint was peeling around this electrical socket. It's old enough where it only has two prongs in the sockets. 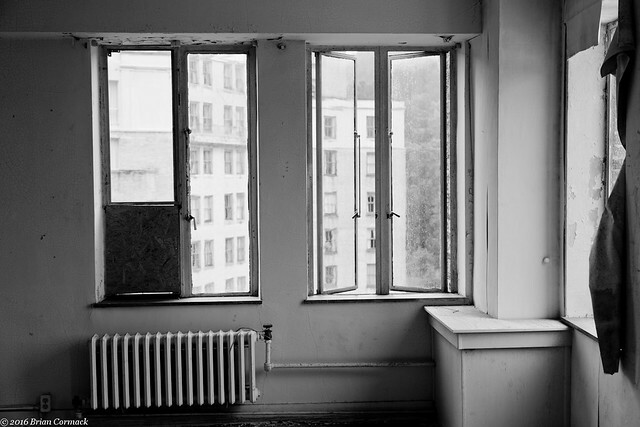 Looking out through a window onto Central Avenue. 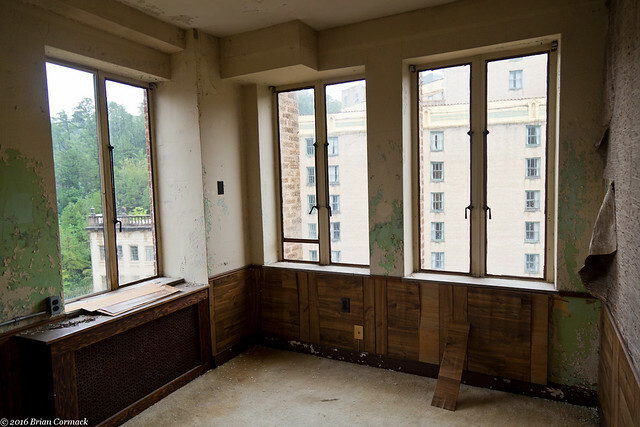 The Medical Arts Building is 16 stories, so there were a lot of rooms to explore. 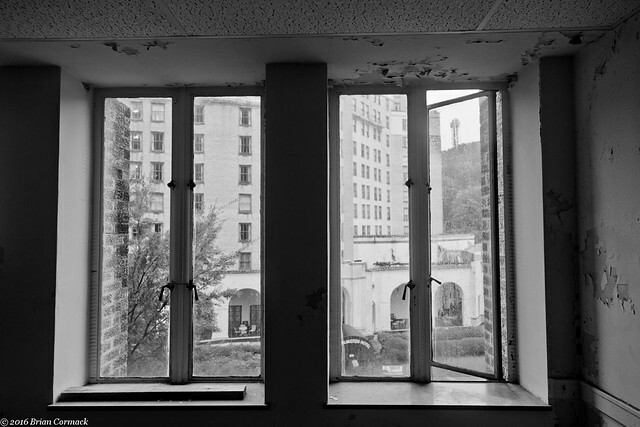 Many of the rooms had a great view of the Arlington Hotel and Central Avenue. 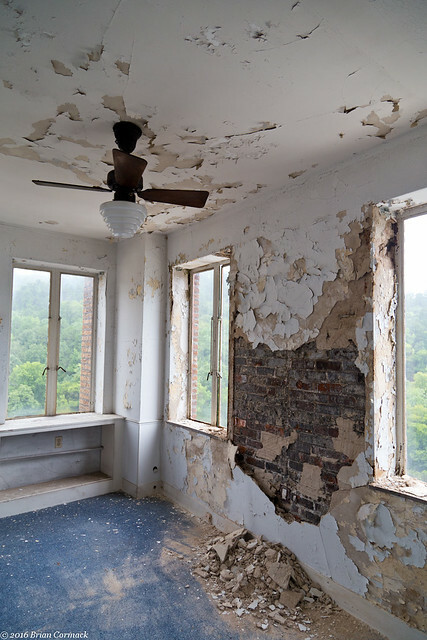 At the top of the building is the penthouse, which features some great views of the city. If I had $1.75 million I would definitely buy the building so I could live there. 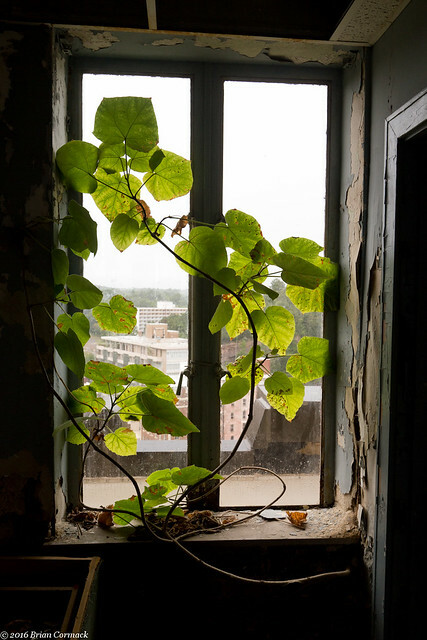 There was some life here, this plant was growing next to one of the windows. It's actually pretty shocking that this spot hasn't yet been redeveloped. The views from the top of the building are nothing short of spectacular. 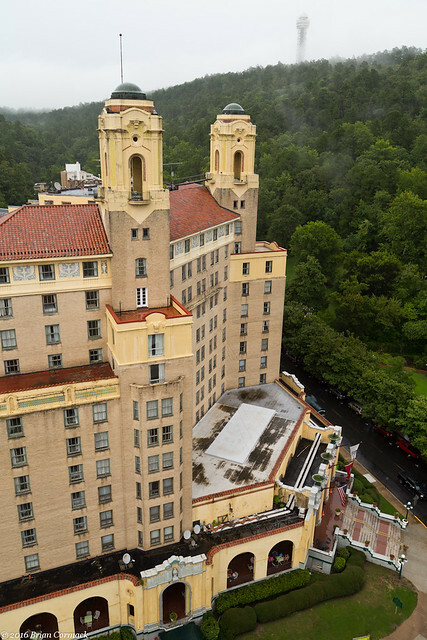 This is the view of the Arlington Hotel, which was built in 1924. And the view looking down Central Avenue. In the background is the Majestic Hotel, which was built in 1882. The hotel grew over the years, with new additions in 1926 and 1963. 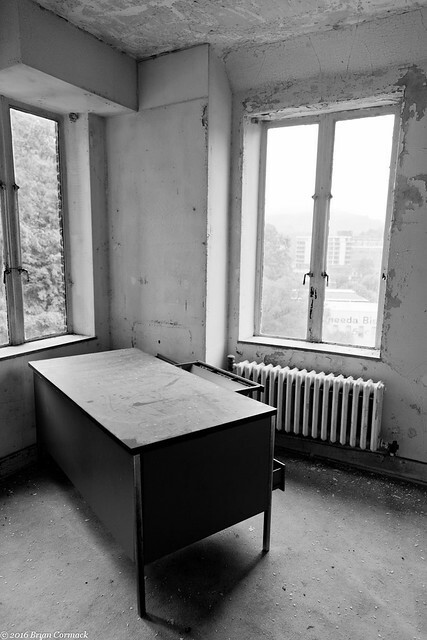 But the hotel closed in 2006, and was abandoned. 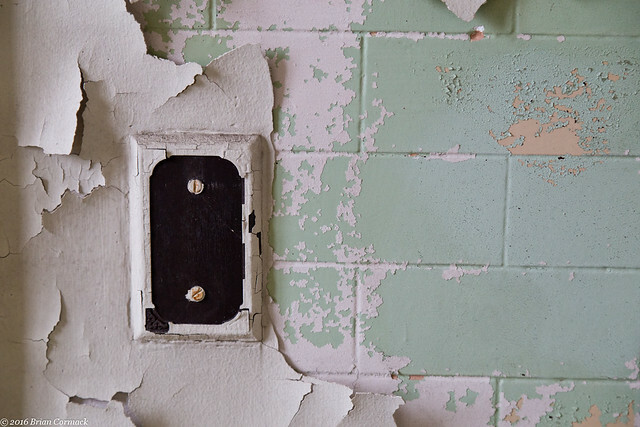 Despite a few efforts to save it, the hotel caught fire in 2014. 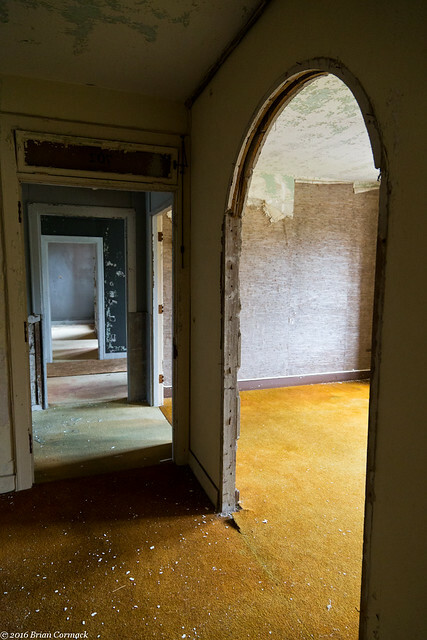 Part of the 1926 addition was destroyed, and the rest of the complex was condemned. 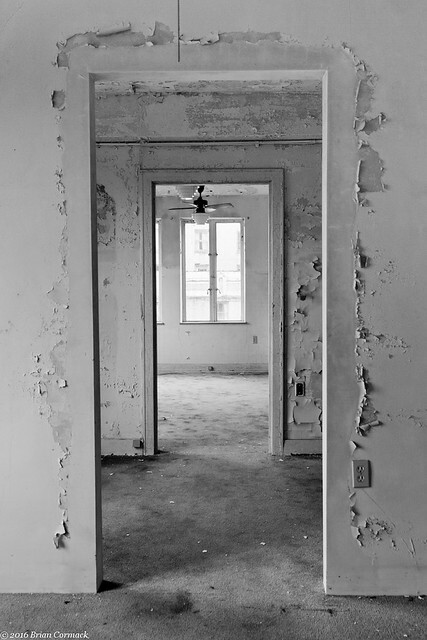 The rest of the hotel is now being torn down, the grand buildings that have graced this stretch of Central Avenue being reduced to nothing more than piles of rubble. This is the view looking south towards Bathhouse Row and Central Avenue. 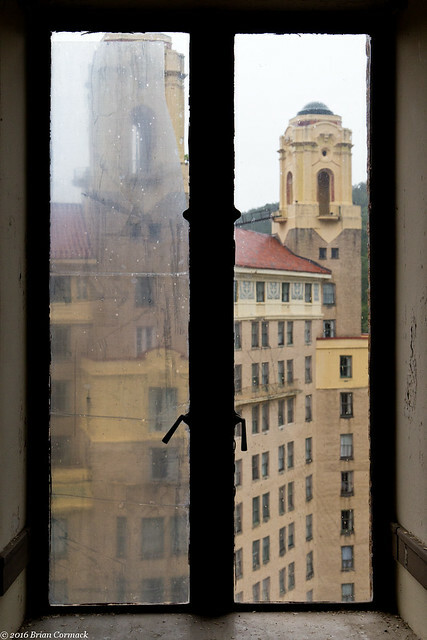 It is a view that perfectly encapsulates the history of this city. 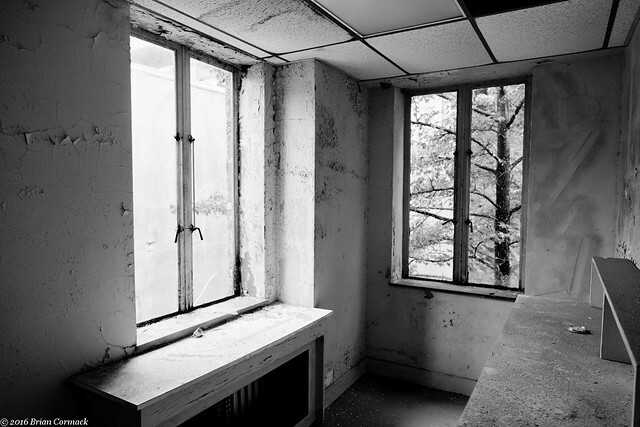 You have a view of the bathhouses, which were all built between 1893 to 1923. In the background is the old Army and Navy Hospital, which was built in 1933. And further in the background is the old Hot Springs High School, which is where Bill Clinton attended school. There aren't many places that can claim this much history, and where so much of the history is threatened. 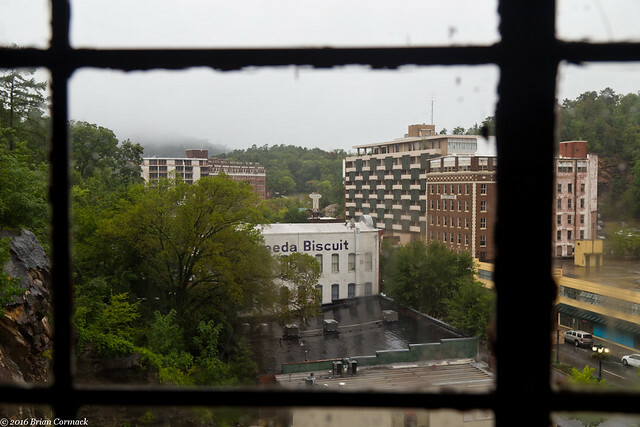 The loss of the Majestic is nothing short of wake-up call to the city of Hot Springs. Several of the old buildings here could easily see the same sad fate of the Majestic, including the Medical Arts Building. 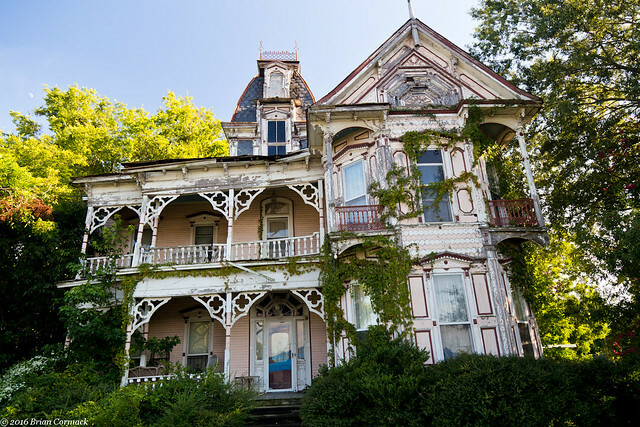 Hot Springs is lucky enough to be home to an eclectic and irreplacable collection of historic buildings. It's a shame and a disgrace when a historic building is lost, and all efforts should be made to preserve and protect the unique architecture of this city. From Pine Bluff, I headed across the Arkansas River and drove through the small town of Altheimer (population about 1,000). 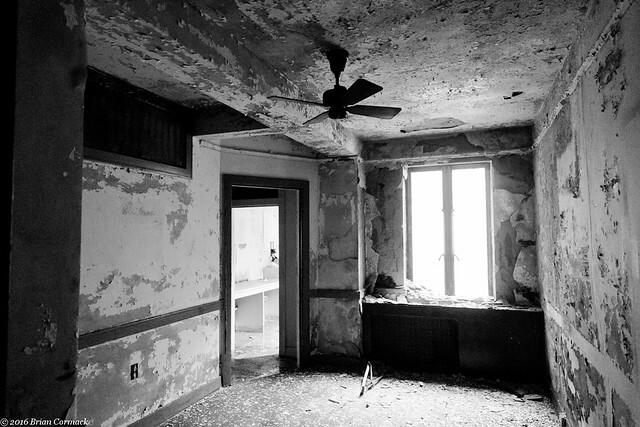 Altheimer was settled in the 1880s around a railroad line, and soon was a thriving town. 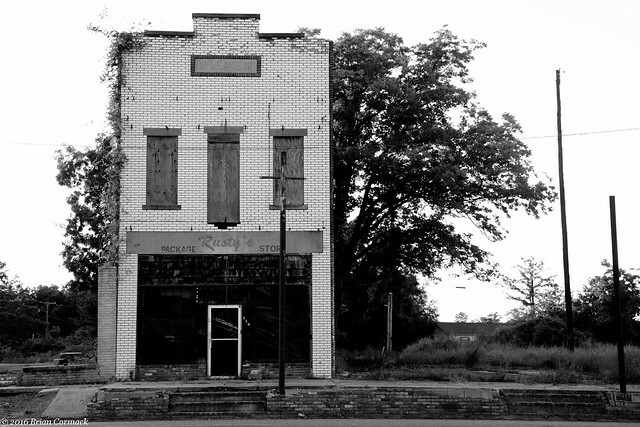 But like so many other Delta towns, Altheimer has struggled economically in the recent decades. The core of buildings that once stood along Front Street in the downtown area are mostly gone (the only way you would even know any buildings were there are concrete slabs that line the street). During the great flood of 1927, the area around Altheimer flooded. People took shelter in the second floor of the buildings downtown to escape the floodwaters. But now only a few buildings remain in the town's downtown. One of those is the Leake Building, which dates back to 1917. It looks like the roof of the building has collapsed in part, and the building has been abandoned. 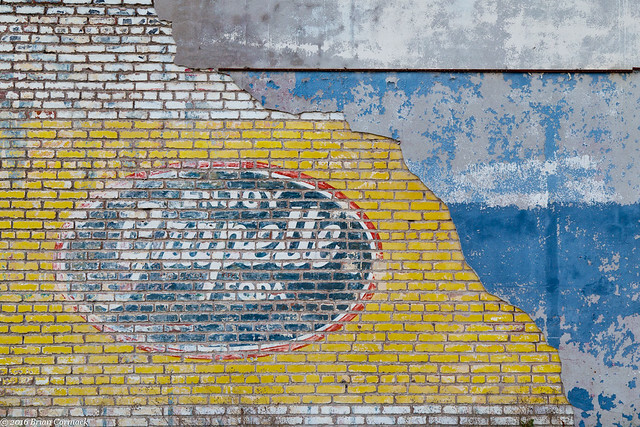 On the side of the building is an old ghost sign for Grapette soda. Grapette was introduced in 1939, and was bottled in Camden, Arkansas. It soon became extremely popular, although sales declined after it was sold to other soft drink companies in the 1970s. By 1977, the Grapette brand was shut down and the recipe was retired in the United States. But in 2000 Grapette made a return, with the original recipe now being produced by Wal-Mart and sold under the Sam's Choice brand of drinks. As I was leaving Altheimer and heading back towards home, I drove over these railroad tracks and stopped to get a few pictures. It was nearing sunset, and the sky and clouds were beginning to show the colors of dusk. 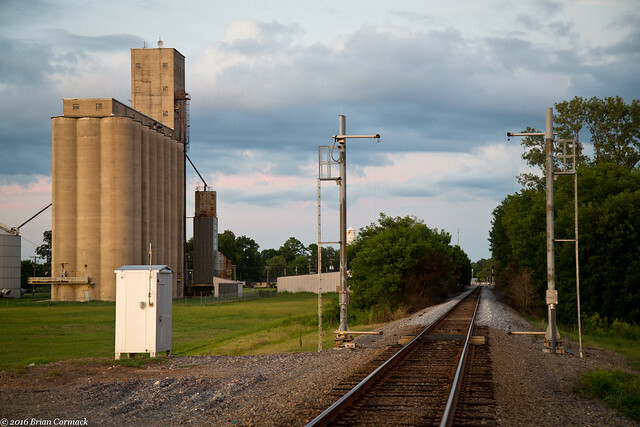 I headed down to Pine Bluff one night after work to try to take a few pictures. I had thought that I had planned everything out, I made sure the camera and tripod were packed up and had fully charged batteries. The only thing I didn't plan to pack was a change of clothes, which meant I had to walk around taking pictures in the clothes I wore to work. Which usually wouldn't be much of an issue except it was nearly 100 degrees that day, with a head index of about 110. With the car AC going full blast, I headed into Pine Bluff. I stopped at the old R.M. Knox House, which was built in 1885. 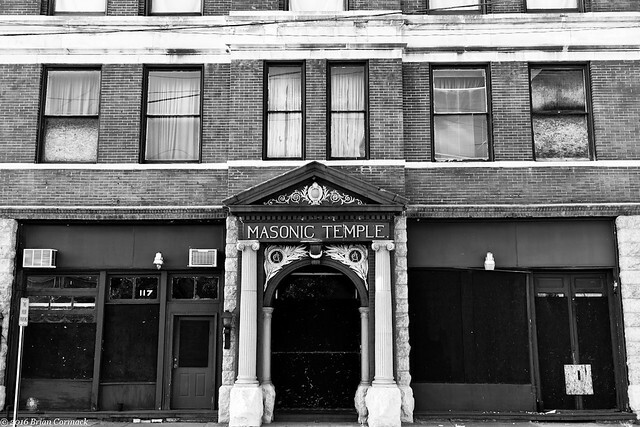 I drove into downtown Pine Bluff and parked by the old Masonic Building, which was built in 1904. When it was built, it was the tallest building in the city. 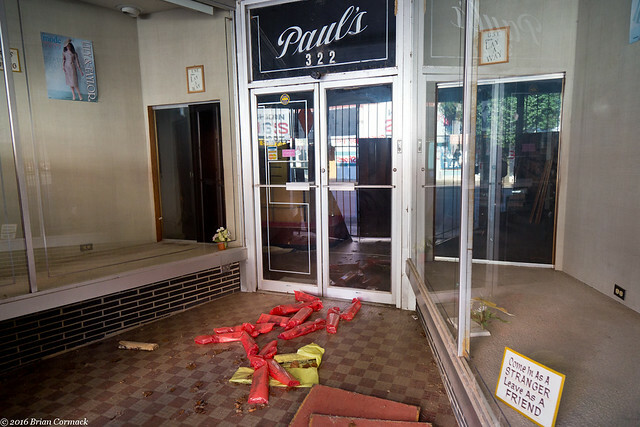 Downtown Pine Bluff is marked by a wide collection of abandoned buildings, many of which are boarded up. 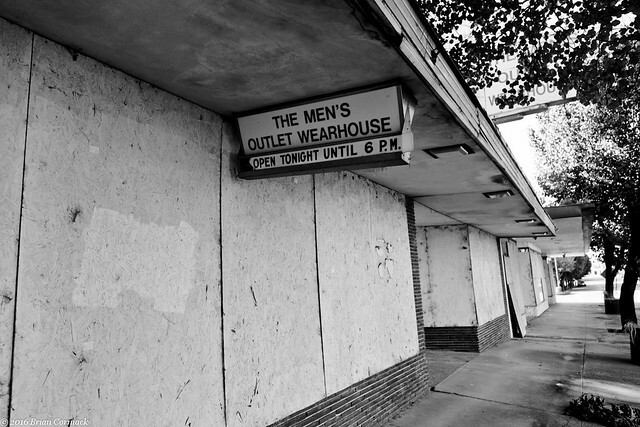 One store was closed, with metal gates across the front. 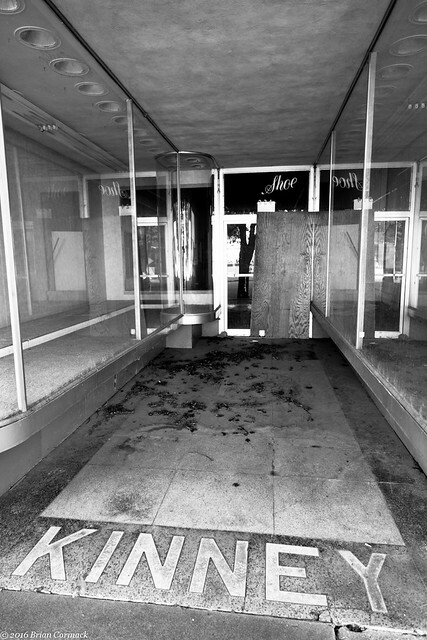 There were a few items in the glass display cases, and a large collection of newspapers piled on the ground by the door. I headed a few blocks over and passed by the old Saenger Theater. 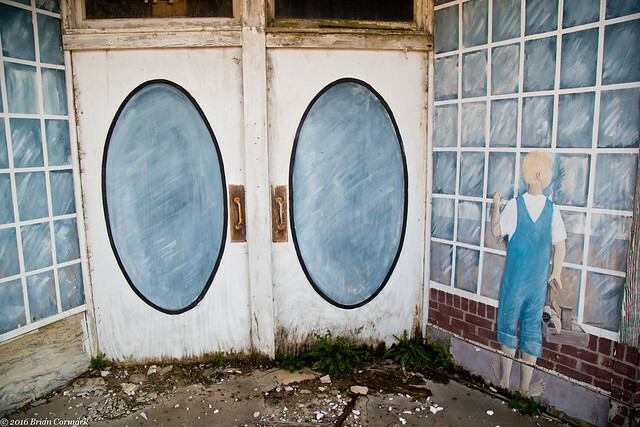 The doors and windows of the old theater are boarded up, although someone went through and painted a few scenes on the boards. The theater is huge, towering four or five stories over the street. It's also an architectural gem. The theater was built in 1924, and was called the "Showcase of the South" when it opened. The theater hosted travelling plays and even had performances from Harry Houdini. But competition from newer theaters led to the Saenger theater eventually closing its doors in 1975. The theater found a few uses in the years since, including serving as the home of the Pine Bluff Film Festival for a short time. 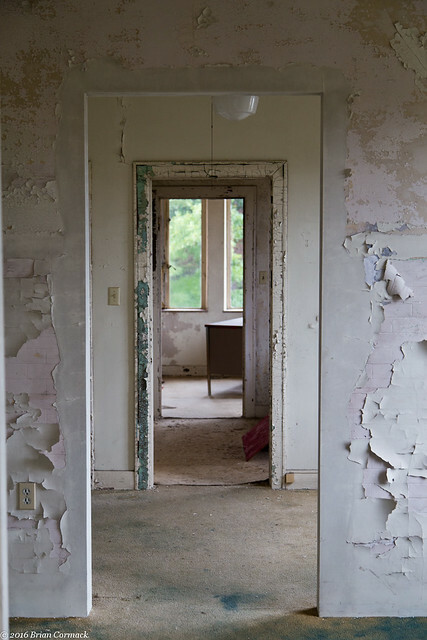 Renovations were made, but water damage from a leaking roof has caused some damage to the plaster on the interior. 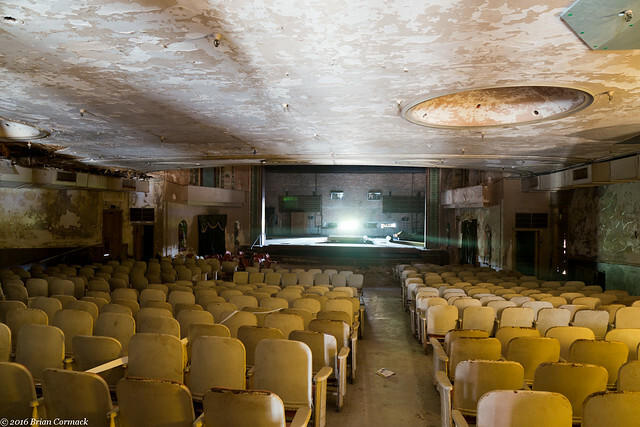 The city of Pine Bluff has taken over ownership of the building, but there is no money for any repairs to the theater. 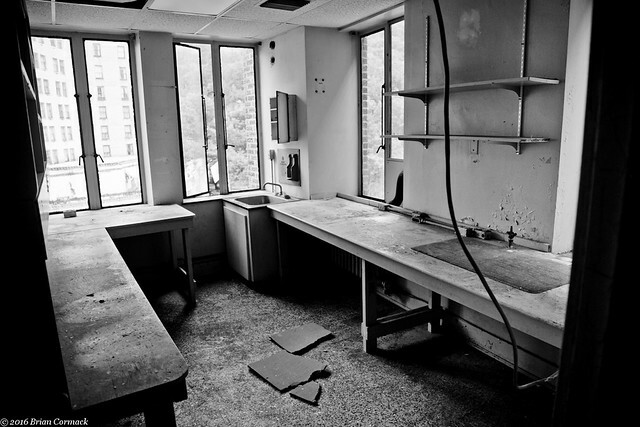 So it sits empty and abandoned. 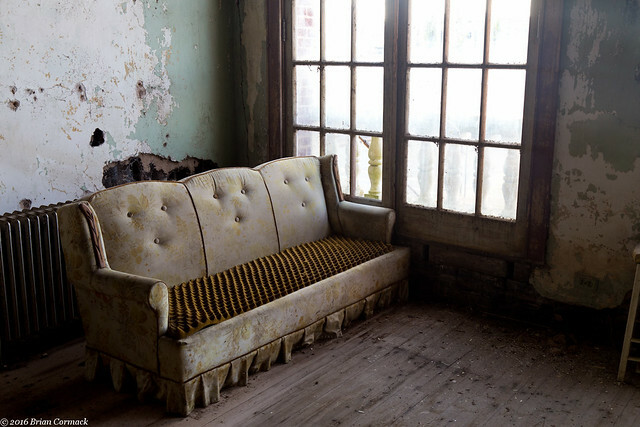 This old sofa sat next to the windows on the second floor, near the doors that lead off to the balcony. The old Saenger Theater is a true gem, but one that forlornly sits forgotten in a downtown that is also lonely and empty. 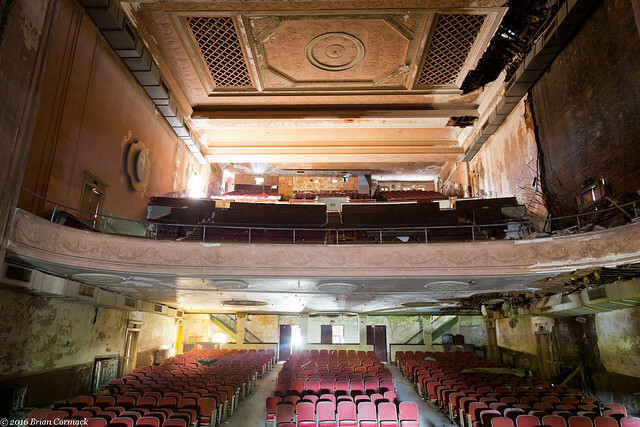 There are still efforts to save the theater, although funds for renovations are low. 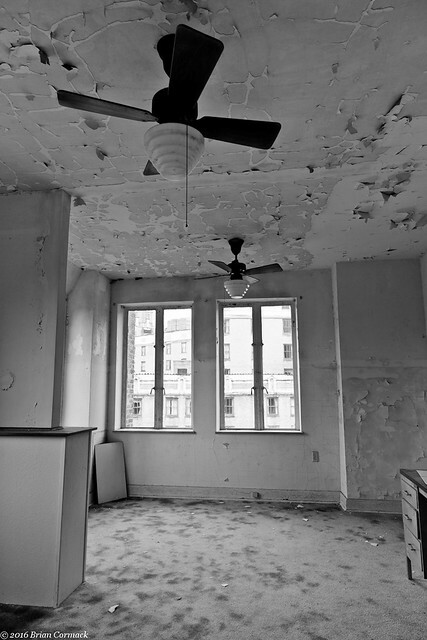 Hopefully it will be renovated before there is anymore water damage.